From Goodreads – Panic began as so many things do in Carp, a dead-end town of 12,000 people in the middle of nowhere: because it was summer, and there was nothing else to do. Heather never thought she would compete in Panic, a legendary game played by graduating seniors, where the stakes are high and the payoff is even higher. She’d never thought of herself as fearless, the kind of person who would fight to stand out. But when she finds something, and someone, to fight for, she will discover that she is braver than she ever thought. Dodge has never been afraid of Panic. His secret will fuel him, and get him all the way through the game, he’s sure of it. But what he doesn’t know is that he’s not the only one with a secret. Everyone has something to play for. For Heather and Dodge, the game will bring new alliances, unexpected revelations, and the possibility of first love for each of them—and the knowledge that sometimes the very things we fear are those we need the most. Honest confession: The synopsis of this novel didn’t do much for me. The fact that there’s no mention of romance had a lot to do with that. Also, the talk of the “game” and the danger and the high-stakes… I don’t know. Just not my thing. Despite my initial reservations, I ended up captivated by this novel. The game turned out to be quite gripping (the challenges had me on the edge of my seat), and the characters are, in true Lauren Oliver form, compelling and beautifully drawn. I thought the dynamic between Heather and Bishop was especially intriguing. Panic is one of those books that seems hopeless as you’re reading — how are these people possibly going to solve all of their problems? — so it was hard to put down, particularly as I hit the climax. And the ending… awesome. Big recommend if you’re looking for a contemporary that’s gritty and unique, and if you’re a fan of stunning, evocative prose. 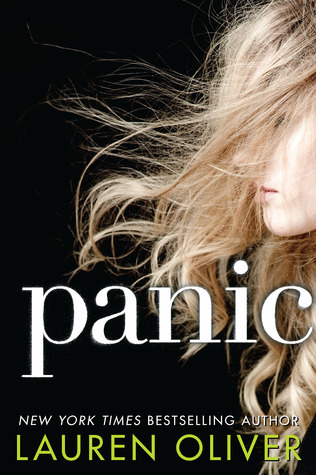 I’m reading PANIC now! It’s my first Lauren Oliver book, but now I have to go back and read her others as it’s gorgeous and so captivating! !